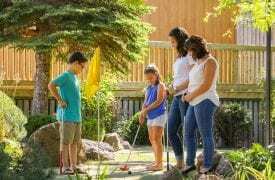 Mariner’s Cove Miniature Golf is a professionally designed 18-hole miniature golf course located at Mariner’s Cove Boardwalk in Cavendish, PEI. Play around our large pond and try to avoid the sand traps and water hazards. You’ll find the lack of side rails on the greens adds an extra touch of challenge! 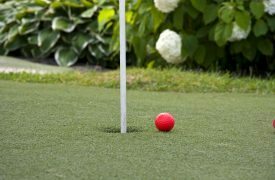 Bring some friends and work on your putting skills. This beautifully landscaped course offers greenery, gardens and sparkling streams. 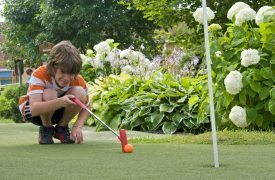 The course will provide a relaxing and charming setting for a fun round of mini golf.